Cacao: This antioxidant-rich raw superfood is bursting with vitamins, minerals, raw enzymes and omega fatty acids that help in preventing free radical damage that causes premature aging and inflammation. It promotes circulation, and increase cellular healing resulting in a toned, bright and youthful complexion. Astaxanthin: This carotenoid is the strongest antioxidant against singlet oxygen. This powerhouse ingredient provides a new dimension in skin treatment technology, effectively working to revitalize dull, tired, prematurely-aging and environmentally stressed skin. 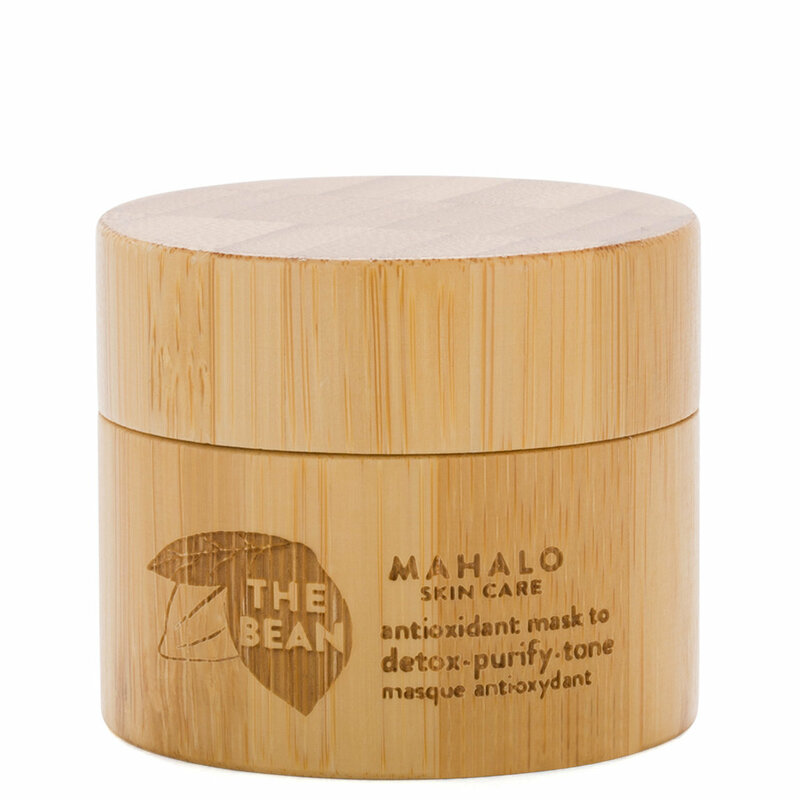 Green Coffee Bean Oil + Coffee Co2: The “secret weapon sidekicks” of the BEAN mask that work in synergy to help tone, firm and rejuvenate the skin. Tomato Lycopene: This superior antioxidant helps to strengthen skin’s natural ability to defend itself against oxidative stress, to maintain visible tone and glow. Edelweiss – This offers high free radical scavenging activity. This clinically tested active helps to protect from environmental stressors – while nourishing the skin and providing a soothing, calming effect. Carrot: This antioxidant-rich superseded helps to repair damaged skin tissue, address skin discoloration, improve complexion, tone and add elasticity to the skin. Sandalwood: This ethically sourced local Hawaiian sandalwood boasts antiseptic, astringent, anti-inflammatory and disinfecting properties that support the skin’s youthful appearance and function. Watermelon: This highly concentrated extract is rich in Vitamin C and naturally occurring carbohydrates and amino acids. It supports the UV-stressed immune system of the skin and is used to prevent photo-aging. Watermelon also helps to protect the skin from everyday toxins and promotes cell renewal. Sea Buckthorn: The single highest source of vitamin E, amino acids, pro-vitamin-A and unsaturated fatty acids: a true skin superfood. Stimulates collagen, combats wrinkles and dryness, reverses the effects of aging and pollution. Ceylon Cinnamon: The delicacy of highest grade cinnamon has been prized for centuries for its skin soothing, anti-aging, anti-inflammatory and antiseptic properties. Phytosterols: an Antioxidant and anti-irritation activity of phytosterols aid in boosting skin’s natural defenses and repair, while helping to calm and soothe damaged skin. Vitamin E: Serves as a scavenger for free radicals that are destructive to the cell membrane, whose integrity is paramount to cell metabolism and life. Infused with a decadent combination of cacao, coffee, and honey, The BEAN Antioxidant Mask’s creamy consistency envelopes skin in a sweet-smelling veil of antioxidant-rich actives. The powerhouse formula penetrates skin’s surface to detoxify congested pores while increasing circulation for enhanced elasticity and radiance. Evenly spread a dollop of paste onto dampened face and neck using a brush or your fingers, carefully avoiding your lip and eye areas. If the mask does not easily apply, blend with a few drops of water or toner. For first-time users, leave mask on for 2-5 minutes. For sensitive skin types, leave on skin for 4-7 minutes. For a deeply enriching treatment, leave on for 20-30 minutes. To remove, slowly massage off the product using warm water. Can be used up to three times each week. Over the moon that Beautylish is now carrying my favorite mask! My sensitive, acne-prone, combo skin loves this mask. Luxury skincare, that's making my skin look healthy and fresh. I'm going to keep this short and sweet because you can check all the claims in the describtion: Everything on there is true for me. I use this mask when my skin looks dull, tired, stressed/irritated or when I want/"need" some selfcare (also love the very noticeably smell of the mask). After this mask, my skin looks like "new", like after a great vacation, fresh, clean, well-rested, calm but radiant - perfect. I came across this mask because of Tarababyz on Youtube. Visit her channel for her experience and reasons for loving it (she has gone through several pots). Not too long ago, Caroline Hirons also recommended Mahalo, so another source for you. If you're looking for moisture, this one isn't it. Something between not drying and slightly drying, depending how my skin was before. It definitely doesn't give my skin any hydration. Mahalo also doesn't claim that this mask would do that. Every other claim I find to be true, just as mentioned. Maybe this mask isn't for people with very dry skin, but I cannot speak for them. Random, but maybe useful (? ): My mother despises dark/black masks because she says they always leave black residue, no matter how careful she is when washing it off. Of course I had to give the BEAN Mask to her to try (well, I talked her into trying it). And I'm happy to report that she didn't have the residue problem with this one. It washes off easily. This is my favorite exfoliating product at the moment. It rinses off very easily, even when I use a plastic spoon to scoop out product from the jar. I would gift this to my mom, but she might not like the price or something. It is a little pricey but I feel it’s worth it for the quality. I love the earthy/coffee bean smell. You might experience a little redness when removing product, but it should fade. Just be gentle, you should only need warm water to remove it but a soft cloth might be okay if you need to remove more dead skin.